Are you learning Spanish or thinking about it? We all have our own learning styles, usually including a variety of tactics. This page includes some tips, suggestions and perspectives on learning Spanish. Perhaps you will find something new that works for you. Today we live in a connected world with a global economy. Whether for work or leisure, being fluent in multiple languages is a huge advantage. Doing business overseas? Job hunting? Want to travel and experience different cultures? If so, you should be studying another language. Spanish is an important second language in much of the U.S. and is widely spoken in other countries. There’s a good chance your neighbor, friend or someone in your family speaks Spanish. 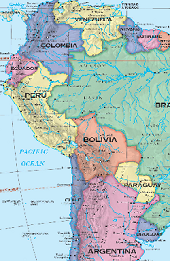 Want to travel to Spain, central or southern America? Your trip will be totally different and much more enjoyable with even some basic Spanish skills. Speaking Spanish opens up new career opportunities and can give you the competitive edge to land that new job. Learning a second language boosts brain power and achievement. Spanish is a beautiful, melodic language. It has a poetic flow that pleases the ear and feels good to speak. For all of us: increased cognitive (thinking) and creative abilities. When we are young: young children who learn a second language demonstrate increased critical thinking skills, creativity, and flexibility of mind. As we get older: learning a second language keeps the brain actively engaged, delaying the onset of Alzeimers and other reductions in cognitive ability (i.e., attentiveness, memory, problem solving). Read more about the research findings at the American Council on the Teaching of Foreign Languages website. On May 30, 2011 the New York Times published a short interview by Claudia Dreifus with cognitive neuroscientist Ellen Bialystok. This conversation reveals that bilingual children have an almost scary cognitive advantage. Being bilingual is like having another entire mind available. With new languages come new ideas of humor, aesthetics, art, culture, politics, literature, history, and so on. People who never learn another language and culture don't really come to understand English or their own culture. Perspective on yourself only happens when you step outside your "native" settings, and learning new languages is about the quickest way. A major reason other countries have a big advantage on us economically. We're telling our schools to wait until our kids are 11 or 12 to start teaching them a foreign language. Other countries are teaching foreign languages from the first years of school. You may also be interested in the related NPR story, Parents Begin Spanish Lessons with Toddlers. The Vistawide website on World Languages lists the following 10 reasons why you should be learning a foreign language. See the website for more information on each. Not enough? Then check out the Huffington Post article "15 Reasons Every American Should Learn Spanish." The demand in the U.S. for employees that can speak more than one language has more than doubled in the last five years. And that's for positions at all skill levels. To compete in today's global economy, businesses need a multi-lingual workforce. That's the bottom line of a March 2017 report released by the New American Economy, a group of Republican, Democratic, and Independent mayors and business leaders who support immigration reforms that will help create jobs for Americans today. 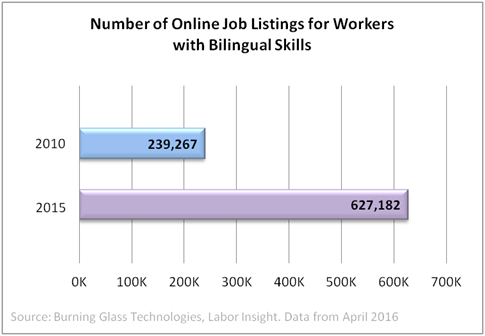 The report used data from online job listings to tell which foreign languages were most in demand by U.S. employers. Spanish was #1, followed by Chinese and then French, Korean and Arabic. The demand for Spanish continues to grow rapidly. Read the report for the details. At about the same time that this report came out, Mexico announced a plan to provide its students with English language classes from elementary through high school, with the goal of making them more globally competitive. Do you need to be bilingual to get the job you want? It's often not a requirement, but it might be what you need to beat out the competition. You'll be more marketable. Can Your Student Earn a Seal of Biliteracy? What's that, you ask? It's an award given by a school or state that recognizes students who have studied and attained proficiency in two or more languages by high school graduation. One of them can be your native language. 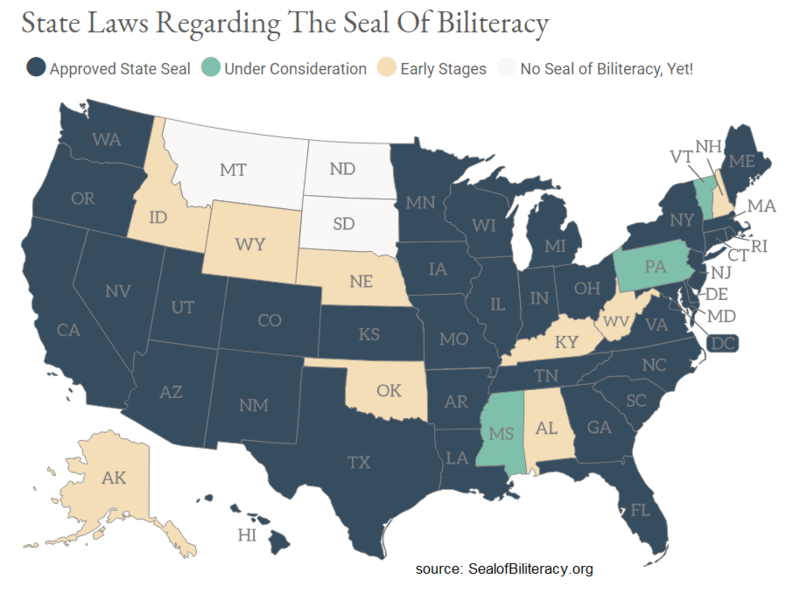 As of June 2017, 35 states (plus Washington DC) have adopted a program under which high school graduates can earn a Seal of Biliteracy with their diplomas, and more states are working on adoption. The program makes a statement that the school believes mastery of two or more languages is important and sets a goal that students can strive to achieve. While many Vermont schools offer foreign language courses, there is no foreign language requirement to earn a Vermont high school diploma. Students planning to attend college generally must meet a language study requirement, either for admission or graduation. Two Vermont high schools, Woodstock Union School and St. Johnsbury Academy, are conducting Seal of Biliteracy pilot programs during the 2018-2019 school year. We have quite a few students who make a mostly annual trip down to Mexico or Costa Rica, and we always talk about the trip afterward. And we always ask about how much they used their Spanish (this is what the classes are for, right?). Sometimes we get an answer like "I was in a resort so I didn't have a chance." That's not the right answer. Yes, there is a big difference between being inside an all-inclusive resort versus being out in small towns with the locals. But there are plenty of conversation opportunities wherever you are. In the resort? Try speaking with the bar tender or person who brings you food and beverages, the wait staff at the restaurant, the tour guide, the concierge, and so on. And around town, the folks selling things, again at restaurants, bus station personnel, taxi or shuttle drivers, you get the idea. These people are usually very nice and polite; after all, you're trying to speak their native language. Many know a little bit of English and they understand what it means to learn another language, so they're patient. So don't be shy, don't just speak with your English speaking friends and don't miss this opportunity. If you want to speak Spanish, then practicing speaking is super important. Put what you know to work and get better at having the words flow out more easily. Even if you can't quite put sentences together, you can probably still communicate successfully. At a minimum you should be able to pick up some new vocabulary from signs and menus. Try to learn as much as you can when you travel but recognize the limitations. The local people will be polite but won't give you lessons or correct your mistakes (See also Don’t Habitualize Errors). Practice is key, but the other part of learning to speak and understand Spanish at a functional level is taking a class. To learn something new, step #1 is the intellectual learning of new subject matter, which is best provided by a teacher. Step #2 is the experiential learning that you get from practice. Does SWC Compete with Language Learning Apps? I was recently telling someone that SWC teaches Spanish classes for adults, students and kids. And he said, "Oh, so you compete with apps like Duolingo and Babbel?" I said, "No, we do lessons with real, live teachers. We actually recommend Duolingo to our students as a supplemental tool for practice, but it's by no means close to as good as learning with a live teacher. If you try learning a language using just an app, don't expect to get to where you can engage in a "real life" conversation. The best way to learn a language is with an excellent teacher and by immersing yourself in the language as much as you can. You need to practice and there are many ways to supplement your class and increase your interaction with the language. You'll find plenty of ideas for how you can do this right here on our website (such as Immerse Yourself in Spanish the Easy Way). What do real, live teachers have that online apps can’t match? Teachers connect with you personally. They can sense if you are “getting it” or not and adjust on the fly. They can be creative and spread a contagious enthusiasm. They can communicate with humor, passion and body language. If you are making mistakes, they can help you understand the error and teach you how to get on the right track. And classes can include a mix of activities that keep things fun and engaging. To sum it up, SWC does not compete with online apps. They can be a helpful addition to your learning program, but they don't replace teachers. As you learn a new language, your attitude is very important. You should be eager and inquisitive. Let the language wash over you. Relax. Open your mind and take it all in. Don't worry too much about rules; accept exceptions. This somewhat nebulous advice was something I had to discover when I started learning Spanish. When I began, I wanted to know all the grammar rules. I thought that Spanish would consist of a series of rules and that it could be mastered similarly to mathematics. Just learn the formulas, right? Wrong. Languages aren't like that. Yes there are rules, but also many exceptions and special cases. And Spanish isn't just English with new vocabulary, it has its own system. There are a lot of similarities but also a lot of differences. I found it disconcerting that learning the rules wasn't enough. I had to change my attitude about language learning -- as per the preceding paragraph. I had to dump my pre-conceptions and take a fresh approach. Perhaps you are an experienced language learner and know all this. If not, prepare yourself to openly embrace a certain amount of ambiguity. For example, you'll learn about "regular" verbs that follow some simple rules, but the most commonly used verbs are usually "irregular." You may find some things in Spanish just don’t seem to make much sense, based on an English-speaking background. Well, they do make sense, they're just different. Spanish is a beautiful language and one of the easiest for English speakers to learn. There are many similarities between the Spanish and English vocabularies, and the pronunciation and spelling in Spanish are relatively straightforward (words are spelled the way they sound and pronounced the way they look). As you learn Spanish, relax, be patient and enjoy the ride. Start speaking as soon as you can and keep at it. Don't be afraid to guess the meaning of a word or phrase from the context. Don't be afraid to make mistakes; it's a natural part of learning a language. But, work to keep improving and eliminating your errors. Maximize your immersion by supplementing your class activities with things that work for you, such as the fun ideas we've listed in the next article, Immerse Yourself in Spanish the Easy Way. Stay enthusiastic and keep practicing! It's great to travel to a Spanish-speaking country and immerse yourself in the language. Similarly, you can improve your learning progress by immersing yourself in the language as part of your daily routine. Don't have the time? Here are 11 suggestions for how you can do this by tapping drive time, relaxation time or via other means that fit Spanish learning into what you are already doing. These ideas are meant to supplement your classes; you can't learn Spanish with these approaches alone. And don't worry if you don't understand every word you run across in these explorations, you'll get more and more with time. Put sticky notes around the house with words you are trying to learn, such as on the bathroom mirror or refrigerator. While shopping, read some of the Spanish that you'll find on signs throughout stores like Home Depot and Lowes. When shopping at the supermarket (supermercado), read a bit of the Spanish that can be found on the boxes of many products. Use the free TuneIn Radio app on your mobile device for lots of Spanish music and voice options. Also, try TED talks (http://tedxtalks.ted.com/browse/talks-by-language/spanish) for video in Spanish, sometimes with subtitles. Easily build your vocabulary by having the Spanish 'word of the day' delivered to your smartphone (see the write-up on our technology page). Listen to Spanish music while driving, cooking, exercising, etc. Try to find singers with easy to understand voices, such as Julieta Venegas. Found a song you like? Check out the lyrics online (such as at lyrics.com) and follow along as you listen to the song; teach yourself what's being said. Pandora is a good way to sample musica latina and often lists the lyrics. Read, whether its online foreign newspapers, the BBC Mundo website, a book or other. This can be a huge help. Make a list of new words that you run across and want to learn. Use some of your relax time and turn on Spanish subtitles or dialogue for a movie or TV show. YouTube has a ton of Spanish language content of all kinds; and, it's fun to explore and browse. See also Have Fun Learning Spanish with Movies and Learning Spanish with Netflix. Carry a mini-reference card in your wallet/bag to periodically do a 10-second review of verb conjugations or vocabulary you are working on. Use mobile device apps such as Duolingo. See Give Duolingo a Try. And for our enrolled beginning students, listen to our MP3 recordings that go with the textbook. These are included as part of your free access to our online resources. In March 2016, National Public Radio aired a story entitled For Adults, Lifelong Learning Happens The Old Fashioned Way. Despite the fact that everything seems to be online these days, they found that many adults still want to learn in classes. Our students often use the Internet to find Spanish in Waterbury Center, but they take our classes because they want to learn from a real person. They value the personal interaction and the ability to ask questions. Others came to us after trying programs such as Rosetta Stone without much success. You will be successful with us as long as you put in the effort. And you'll find that our classes are fun, too. That's the way learning should be. The Duolingo language learning pillow, priced at $99, was their April Fools' Day joke; obviously no one learns a language overnight. Duolingo however is a very good online tool that can be a worthy part of your language learning (see Give Duolingo a Try). So how do you learn Spanish as an adult? Take a class from a good teacher. Supplement your class in ways that work for you to increase your interaction with the language. You'll find plenty of ideas for how you can do this right here on our website (such as Immerse Yourself in Spanish the Easy Way). A lot of websites require that a password be only 6-12 characters long, which by itself not very secure. If you want a more secure (but longer) password, use a phrase you can remember like VoyaLograrMuchoHoy=55! When it's time you change your password, you'll have learned your word and will be ready for another. As you continue to build your proficiency in Spanish, it’s a good idea to periodically assess your skill level. This will help you to both see your progress and identify your strengths and areas that need more work. One example is the LinguaFolio self-assessment grid, from the National Council of State Supervisors for Languages and discussed below. A similar assessment grid is available from Concordia Lanugage Villages; you can request a free copy from them. This is not a test of grammar or vocabulary. You'll be assessing your proficiency by choosing the level description that fits for you. It should only take about 5 minutes to complete. There is a row in the grid table for each of the five skills of listening, reading, person to person communication, speaking, and writing. Simply read the short descriptors for the reference levels and determine where you think you are for each. Make a record of your results so you can compare them with a future self-assessment. How did you come out? The results can help you think about your language learning goals, identify areas you need to work on and then develop strategies for building your proficiency. For example, if your level on reading is not up to par, you should try to read more. If you are missing too much of what others say, try watching videos or movies in Spanish or listening to music in Spanish. And if you think you've been improving but are not sure how much, this assessment will help tell you. I recently returned from two weeks in Chile and Argentina, and spoke only Spanish during this time. For background, I should say that I'm in the SWC advanced class and my Spanish is decent but I still have a lot to learn. People there told me that I spoke very well although this seems to be a universal, complimentary response. So how did all this practice listening and speaking and reading things like signs and menus help me improve my Spanish? And how did it not help? Even if you have a solid academic base, it takes a lot of practice to be able to understand sometimes-rapid speech and then to speak such that the words flow smoothly from brain to mouth without too much processing along the way. I think the immersion helped me some on both counts. If nothing else, I felt more comfortable. We know from how our brains work that to remember something, you have to revisit it multiple times after the first encounter. Essentially, this causes your brain to conclude that this item is important and should be safely put in memory instead of being deleted as part of the normal cerebral housekeeping. My immersion experience helped me to better cement the Spanish that I used and facilitate a smooth brain-to-mouth flow. I also picked up a few expressions that I heard a lot. That’s all good, but perhaps it is more important to tell you what I didn’t learn. For instance, I didn’t learn very much new vocabulary. While I “learned” some new words during conversation or from reading signs and other things written, I later forgot most of them. If I didn't, for example, make proper use of the verb tenses, no one said anything. Any errors I made speaking were not corrected, and since my brain worked to cement the Spanish I used, it likely also cemented my mistakes. This has the unfortunate downside of helping to turn them into bad habits. (see Don’t Habitualize Errors). I certainly don't want to suggest that learning by immersion is bad, just that it's very helpful in some ways but not much help in others. The ideal situation is a combined immersion-plus-class program. This allows you to reap the benefits of immersion and avoid the risk of developing and cementing a spoken Spanish with a lot of mistakes. It is very difficult for an adult to learn to speak correctly solely from immersion. 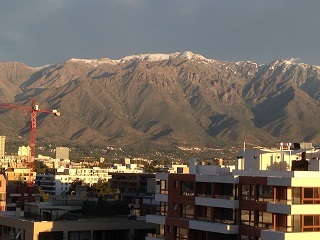 Nearly three years after the trip I reported on the above trip, I returned to Chile for 10 days. During my stay I spoke almost entirely in Spanish. Immersion is a good thing when you're learning a language, but as I reported above it's not a panacea. Yet this time I had three more years of the SWC advanced class under my belt, along with other practice. So how did I make out this time? My conversational interactions included family, Chileno friends, people at the store, and tour guides. For the most part, I did pretty well. My speaking skills are better now and I had no problem holding up my end of a conversation. I no longer have to think about every word before I say it. Of course, it's a help that a large percentage of conversation is in the present tense. Probably harder than speaking is listening comprehension. On this I did pretty well. I understood some people perfectly but had a lot of trouble with some others. This seems to always be the case, even with your native language. When I didn't understand something I tried to ask for clarification. That's a lot better than guessing incorrectly, especially if you're talking about something where correct understanding is really important. See the video of my mountain biking guide interviewing me in Spanish for his Facebook post. On my last trip I didn't learn much new vocabulary, but did better this time. This came from reading a lot of signs and from asking about new words in conversation. In both cases, meaningful context helps one remember the new words. What about grammar? If you're learning Spanish as an adult, you need to learn grammar to speak correctly above a fundamental level. Well, there aren't any grammar lessons when you're chatting with the woman at the frutería, nor corrections if you make a mistake. That's fine, but these are critical learning components to becoming fluent. That's where classes come in, where progressive grammar lessons and tactful error corrections are skillfully blended with conversation. Overall, using your Spanish is always a good thing. The more you speak, the more easily your words will flow. Traveling to a Spanish-speaking country is a wonderful way to improve! A concise article appeared on the BBC website with the “secrets” for doing just that. 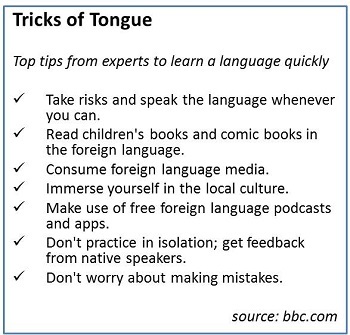 While not exactly secrets, they are indeed good tips for language learning. You’ll find much the same right here on the SWC website, in our collection of writings in On Learning Spanish. Both are worth reading. Shown here are the bullet points from the article. 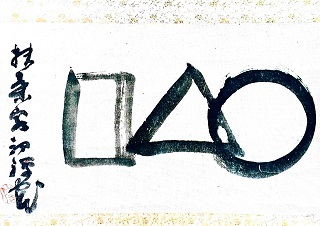 It all adds up to self-immersion, seizing opportunities, mixed media and enjoying the ride. You will of course need to adapt to your schedule and do what works best for your learning style. There are a lot of similarities between Spanish and English, although any student of Spanish knows there are also a lot of differences. A good learning tip is to build from the similarities; it's simply easier to add to what you can say by using sentence structures you already know that also work in Spanish. One of these is the use of the verb Ir (to go) combined with other verbs in the form Ir + a + infinitive. You can use this to speak about the future without having to use the future tense. So once you know the Ir verb, you can combine it with other verbs for which you know the infinitive, even if you can’t remember the conjugations. Learn this and you’ll use it a lot. Note that these common English sentences are the same in Spanish. Easy, right? Example: Voy a llamar mi hermano mañana. 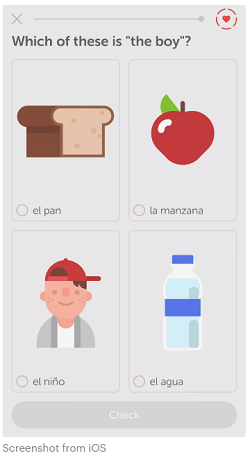 Example: Vamos a comer afuera esta noche. Example: Voy a viajar a Santiago, Chile. The best way to learn Spanish is to immerse yourself in the language as often as possible. One easy and fun way to do this is to listen to music in Spanish. Do this while you're doing something else and save time. It doesn't matter if you don't understand all the words, you'll improve over time. If you find you are missing more words than you'd like, look for the lyrics online (such as at lyrics.com) to see what you're missing. We recommend the music of Julieta Venegas and Tish Hinojosa as both have clear voices that make it easier to pick out the words. 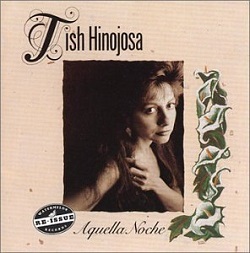 Perhaps the best of each singer are the following albums: Limon Y Sal (Venegas) and Aquella Noche (Hinojosa). Earlier this month, Amazon started rolling out a Spanish-language option to its U.S. website. As shown in the screenshot, you'll now find an EN/ES global symbol near where your name is shown. Just move your cursor to the symbol and then click the button for Spanish in the window that appears. Most of the website information will then switch to Spanish. While Amazon hopes this will make your shopping experience more convenient, at the same time this is a very visual and useful Spanish language learning tool. You can use your time on Amazon to immerse yourself in some Spanish. This is a rather unique learning tool in that if you are familiar with Amazon, you'll see new words in context and recognize them without having to look them up. For example, the yellow 'Add to Cart' button will say 'Agregar al Carrito' and you'll recognize it. You'll easily see that your 'order' is your 'pedido' in Spanish. Try switching to Spanish and then use the search box to enter your text in Spanish. Amazon helps you with the pulldown window of suggestions even before you're done typing. It's easy to swap between languages whenever you want, so this a another way to add to your learning program without hardly trying.